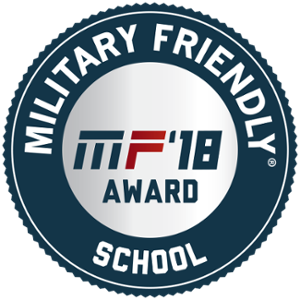 Southern Illinois University Edwardsville has been designated a 2018 Military Friendly® School by Victory Media, the leader in successfully connecting the military and civilian worlds. SIUE attained the designation for the ninth-consecutive year. The premier Military Friendly® Schools designation provides service members and their families with transparent, data-driven ratings about post-military education and career opportunities. The Military Friendly® Schools designation is awarded to the top colleges, universities, community colleges and trade schools in the country that are doing the most to embrace military students, and to dedicate resources to ensure their success both in the classroom and after graduation. The methodology used for making the Military Friendly® Schools list has changed the student veteran landscape to one that is much more transparent, and has played a significant role over the past nine years in capturing and advancing best practices to support military students across the country. Institutions competed for the elite Military Friendly® School title by completing a survey of more than 100 questions covering 10 categories, including military support on campus, graduation and employment outcomes, and military spouse policies. Survey responses were scored against benchmarks across these key indicators of success. In addition, data was independently tested based upon the weightings and methodology established by Victory Media with guidance from an independent advisory board of higher education and recruiting professionals. SIUE will be showcased along with other 2018 Military Friendly® Schools in the December issue of G.I. Jobs® and in the annual Guide to Military Friendly® Schools. Find more about Military Friendly® ratings, methodology and awards at militaryfriendly.com. The Military Friendly® Schools designation process includes extensive research and a data-driven survey of thousands of schools nationwide approved for Post-9/11 GI Bill funding. The school survey, methodology, criteria and weightings are developed with the assistance of an independent advisory board comprised of educators and HR, diversity and recruitment professionals from schools across the country. The survey is administered at no cost and open to all post-secondary schools that wish to participate. Criteria for consideration can be found at militaryfriendly.com. Founded in 2001, Victory Media is a service-disabled, veteran-owned small business (SDVOSB) that connects the military community to civilian employment, educational and entrepreneurial opportunities through its G.I. Jobs®, Military Spouse, Vetrepreneur®, STEM JobsSM and Military Friendly® brands. Learn more about Victory Media at victorymedia.com.